As a former Major League Baseball player, I’m here to tell you that you don’t need steroids to be successful, and I’m a perfect example. Just take a look at my illustrious career between 1985-1989 and you’ll see that performing enhancing drugs just aren’t necessary to find success in this sport or in life. In case you aren’t already aware, my name is Charles Scott Madison, though my fans always called me Scotti. 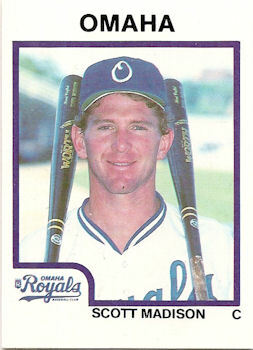 I played 71 games over five seasons with the Detroit Tigers, Kansas City Royals, and Cincinnati Reds. Three, that’s three, Major League Baseball teams wanted me on their roster over just five years—and all without the use of human growth hormones. I remember that once in the locker room, a fellow player offered me a whole host of drugs that would help me in my career. He had lean mass builders, stimulants, blood boosters, and many different types of anabolic steroids. But I rejected every one of them. And then I went on to a career batting average of .163 with 11 RBIs and 1 home run, proving that you don’t need huge, medically enhanced arms to hit the ball out of the park—just some talent and a lot of hard work. But my successes didn’t end there. After my amazing career in the major leagues, I went on to join Aflac and professionally sell insurance for that prestigious institution. I was the number one salesman out of 60,000 Aflac agents. I won the Chairman Emeritus Award for my distinguished sales achievement, which is an award given only once a year. Thanks to Aflac, I was able to buy a beautiful three bedroom house in one of the best subdivisions in Pensacola, FL. And again, I did it all without the use of any kind of performance enhancing drugs. No adderall, cocaine, or even caffeine—I’ve been coffee free since 1992. Most recently, I wrote a book called “Just a Phone Call Away: A Major Journey through the Minor Leagues.” It’s about the minor leagues and all the wonderful players and coaches who never cheated and only used their God-given gifts and never-ending dedication. Not a single one of them used any xenoandrogens, beta-2 agonists, or selective androgen receptor modulators, and many of them went on to have remarkable careers in the minor leagues. You’ve heard of many of them, I’m sure. Knowing that success like mine can come without cheating, it’s a real shame to see someone like Alex Rodriguez who felt like he needed to stick chemicals in his arm in order to achieve his dreams. Sure, he has spent his entire career in the spotlight, becoming famous on an international level, dating super models and getting everything he ever wanted. And sure, he has a career batting average of .300 with 647 home runs and 1,950 RBIs. And sure he has made millions upon millions of dollars, and will continue to make millions of dollars even if he is officially convicted of using performing enhancing drugs. And he’ll probably get into the Hall of Fame eventually, once people forget the steroid thing. But he has lost his integrity, which is invaluable, if you ask me. And I’m here to tell you that you can have an amazing life like mine if you don’t cheat and follow all the rules. It’s worth it. Thanks so much Esther! Please stay tuned and share with your friends!